A while ago I was contacted by Sainsbury’s to see if I could make a visually stunning salad, as they have teamed up with food artist Amber Locke to encourage people to be more creative with their salads. At the moment we have been enjoying halloumi cheese, often grilled with a salad and some quinoa. Then on Sunday after the 10K we went to Bill’s and I had one of their specials which was a salad with grilled honey peaches and halloumi. The sweet fruit and salty cheese went so well together, so we decided to make a similar version at home. Slice the cheese and put in a pan, Heat for a few minutes on either side. Heat the pouch of quinoa in the microwave. I loved it and we both agreed that it is something we would make again. The watermelon and cheese just went perfectly together- I think the texture of the watermelon was even better than the peaches at Bill’s. 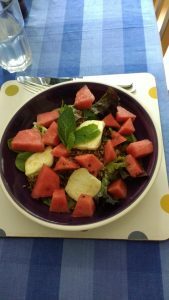 It was also good to have a mixture of warm (quinoa and cheese) and cold (salad and watermelon). I don’t normally think to add herbs to salads either, but the mint just went so well and I am glad we used it. Andy did comment that we should have bought some blueberries too, and then it could have been a 4th of July salad (we had it on Monday) but we were eating it by then- maybe next time! Do you like cheese and fruit in salads? Or salads with warm and cold ingredients? *I was sent a voucher from Sainsbury’s to cover the cost of the ingredients. All opinions are my own. 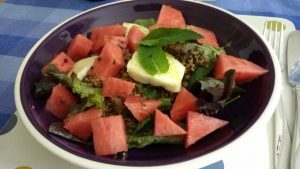 I really love adding watermelon to my salads for sweetness and they make them really refreshing. Yum! Love fruit and cheese in a salad, yum! Previous Previous post: WR10K 2016- my, that was hot!